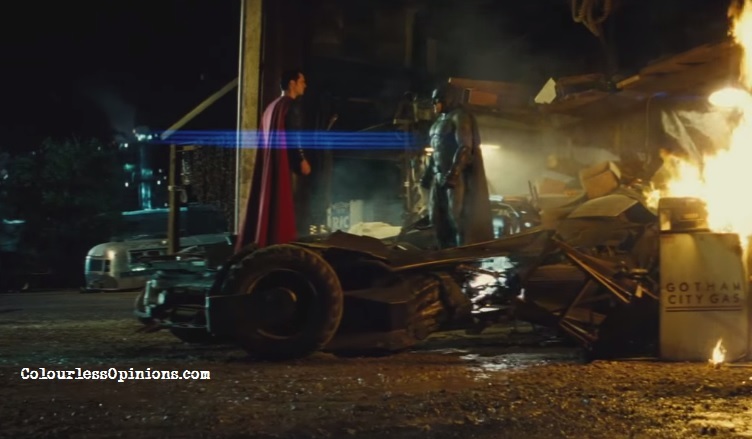 Promotional trailers these can’t help revealing too much these day but for Batman v Superman: Dawn of Justice, it’s forgivable ’cause it looks freakin’ epic… and hopefully not overbloated. The trailer, released in conjunction with Comic-Con 2015 in San Diego, reveals more than just a bit of the plot. It appears that Bruce Wayne (Ben Affleck) is pissed off with Superman’s (Henry Cavill) reckless battle against General Zod (Michael Shannon) in the first film as people at the Wayne Tower were some of the dozens who were killed. The law, too, is holding Superman responsible. Bruce, who’s probably retired from being Batman, trains to get back in shape to “stop” Superman as he believes he has the power to wipe out human race. The trailer also shows glimpses of Bruce’s flashbacks of his origin story, Batman seemingly fighting in a war in the desert, Wonder Woman (Gal Gadot) fighting whoever, the surfer-haired Mark Zuckerberg non-bald Lex Luthor (Jesse Eisenberg) with a Kyptonite and having Superman kneel before him, and easter eggs of The Joker and possibly the young Aquaman (Jason Momoa) as well. It seems that there’s going to be loads of action between Batman and Superman, which is promising. The CGI could probably still be largely improved though.